April 25, 2016 -- The Portland Steel have acquired offensive lineman Duke Robinson from the Jacksonville Sharks in exchange for wide receiver Jamar Howard. Robinson, who is in his fourth season, is listed at 6'5" and 345 pounds. He had yet to appear in a game for the Sharks this season. He is a native of Atlanta, Georgia, and was selected with the 163rd pick in the fifth round of the 2009 National Football League draft by the Carolina Panthers, where he spent the better part of three seasons on the team's practice squad. He was signed as am off-season free agent by the Tennessee Titans in January 2012, then released by the Titans three months later. Following his stints in the NFL, he has spent time in the AFL with the Utah Blaze, Spokane Shock, Philadelphia Soul and San Jose Sabercats before landing in Jacksonville prior to the start of the 2016 season. He caught one pass for nine yards in 2013 with the Blaze. 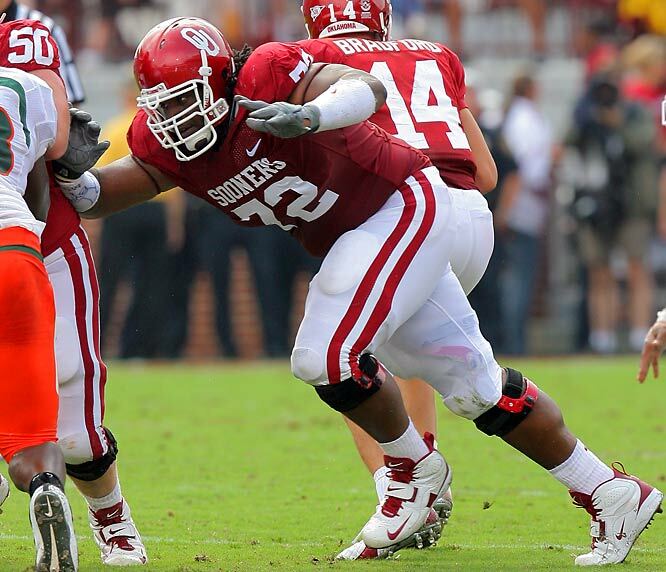 Robinson attended Oklahoma University, where he earned First-Team All-Big-12 honors in 2007 and 2008. He also was a consensus All-American the same two years. Robinson is the grandnephew of legendary singer/songwriter Smokey Robinson. Howard came to Portland mid-way through the 2014 season. He played in 11 games that season, catching 44 passes for 664 yards and 9 touchdowns. He followed that up with 51 passes for 711 yards and 14 touchdowns in just six games last season. He was atop or near the top of all major receiving categories five games into the season before suffering a leg injury which kept him out until the season finale. Howard holds the distinction of registering Portland's first kickoff return for a touchdown in team history. Howard has been on Portland's Other League Exempt list this season. Photo Credit: Duke Robinson in 2009 at University of Oklahoma courtesy alchetron.com.